What the heck is an orthoptist? We’re glad you asked! June 2nd, 2014 marks World Orthoptic Day, and at the Children’s we have 4 licensed orthoptists working in our Ophthalmology department year round. So what does an orthoptist do? Orthoptists are allied health care professionals who work in conjunction with ophthalmologists. They’re trained to test, treat and monitor several eye diseases, offering vital protection against vision loss and sight problems. They can also evaluate patients in order to make a decision on the ideal time for surgery or introduce different therapies to help with vision problems that aren’t operable. While you may never encounter an orthoptist in your health care journey, they play a very important role in ensuring our patients are offered the best possible care to manage their vision problems. Join us in thanking them for the great work they do year round! 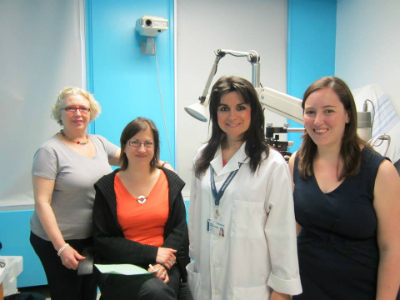 Montreal Children's Hospital orthoptists from left to right: Raquel Beneish, Stéphanie Oglietti, Gaëla Panier and Leah Wood.